Byron Bay is located northwest of Boyfriend Beach in the Palace District in north Irukandji. Byron Bay is an open sea and takes its name from the town in NSW for no specific reason. In the east and south, the region provided beaches for Coraki Lagoons and Split Rock Mountain respectively. 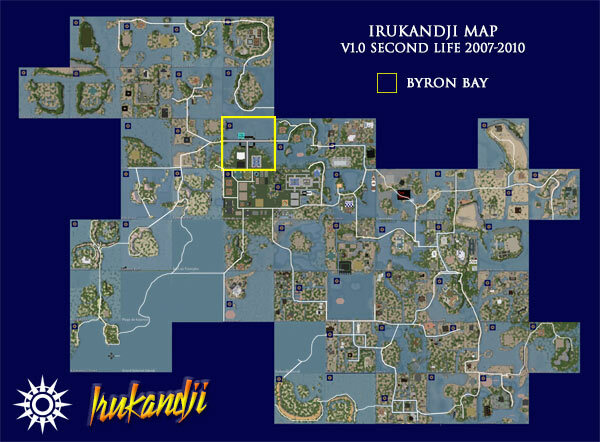 The sim was significant in that it linked the "old Irukandji" continent with the newer Jillaroo estate. It was also the main western conduit for the Odin River. To achieve this, a 200 metre long stone-and-concrete bridge was erected, part of the Trans Irukandji Causeway that fully traversed the sim, so tall that a four mast sailing ship could pass underneath. 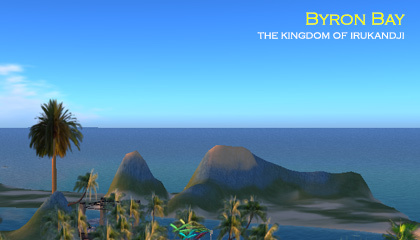 Clockwise from southeast, adjoining sims were Boyfriend Beach, Splitrock Mountain, Coraki Lagoons, Tanawayo Beach, Coolangatta, and Palace Lagoons. Only one photograph has surfaced to date of Byron Bay.